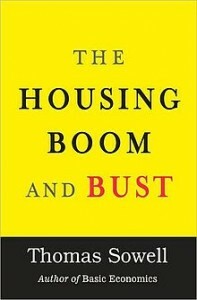 Jason Hartman talks with Thomas Sowell from the Hoover Institution about the cycles of boom and bust in the US housing market. Jason Hartman: Welcome to the podcast for The American Monetary Association. This is your host, Jason Hartman and this is a service of my private foundation, The Jason Hartman Foundation. Today we have a great interview for you, so I think you’ll enjoy it. And comment on our website or our blog post. We have a lot of resources there for you, and you can find that at AmericanMonetaryAssociation.org or at JasonHartmanFoundation.org. Thanks so much for listening and please visit our website and enjoy our extensive blog and other resources there. Jason Hartman: It’s my pleasure to welcome Thomas Sowell to the show. He is the author of the housing boom and bust, just listed on the New York Times expanded best seller list. Thomas thank you for joining us today. Thomas Sowell: Thank you for having me. Jason Hartman: Tell us a little bit about your perspective. It looks like from the book, you are saying that both parties are to blame, so this is a pretty bi-partisan effort it sounds like. Thomas Sowell: Yes, in fact I’ve often said long before this crash that things in the bi-partisan are usually twice as bad as things in a partisan. The democrats did take the lead in this, but the republicans contributed too much for them to try to blame democrats alone. The fundamental problem with all of this, it’s a very complicated story once you get into all of the derivatives in Wall St and this and that, but the fundamental problem is that the money that financed all the fancy Wall St derivatives and so on all came from millions of people paying their monthly mortgage bills. And when that monthly mortgage money started not coming in, when people started being delinquent and defaulting on their loans, then it really didn’t matter what the clever people in Wall St were doing. If the money wasn’t coming in, it just wasn’t coming in. So the real question is why was there suddenly all of this delinquency and default in the mortgage market? And the answer to that is that banks and others were pressured into lending to people who did not meet the standard that had been in use for decades. Things like the 20% down payment, and verified income and so on, and under pressure from the government. And more than pressure, there were actual quotas set up for Fannie Mae, Freddie Mac. Jason Hartman: Now when you talk about that pressure, are you referring to the CRA, the community reinvestment act? Thomas Sowell: Yes, but not by itself. Because that act was passed in 1977 and it really didn’t do an awful lot until the 1990s. And what happened then was that people began to use that act as the criteria for the deciding whether regulators would allow banks to make business decisions of a sort that unregulated businesses make all the time. For example, if a bank wants to acquire another bank, or a bank wants to go into some other, like sell securities for example as the later laws allowed, then only those banks who’s lending practices and other practices under the community reinvestment act met the government approval, would then be approved to make acquisitions, mergers and other kinds of transactions. Jason Hartman: These banks were under an enormous amount of pressure, would you say, to make bad loans for political correctness reasons? Thomas Sowell: Well yes. For example there were a number of banks who were accused of discrimination. They were accused. They were not proving anything. And on that basis alone, the regulators could simply hold up any decision that they had until the legal case was disposed of. Well as you can imagine, running a business, you’re not allowed to make the decisions that your competitors are making. Until such time as a legal case is settled, which can be years. And which in some cases can be more than a decade, obviously is a crippling power. And so you cave. Jason Hartman: It’s just amazing to me how people throw around words like racism. I was talking about this on my show just saying that look, these banks made such imprudent loans, and someone sent me a question saying, “I don’t want to think you’re being racist by saying that certain people didn’t deserve to own a home” and I’m thinking that is just the most ridiculous statement. Why would you even ask me such a question? The determination should be whether or not you can afford the property and whether or not you have good character in making payments in your past. Thomas Sowell: Yes, well of course. It seems so obvious that you wonder why people don’t see it, but many don’t and the media is doing very little to clarify the situation. Once the accusation is made, it’s tantamount to conviction. And many of the studies that have been done, I’ve looked at the studies in some detail and if you were serious, you wouldn’t convict somebody of jay walking on the basis of this kind of evidence. One of the problems that’s not been mentioned at all I think is that there are interest rate ceilings. The lower the interest rate ceiling, the higher the credit rating of the people that you’re going to lend to. If you bring this interest rate ceiling down low enough, you will lend only to millionaires, and if you bring it below that you’ll lend only to billionaires. So the very fact that there’s a ceiling means that there will be a desperate impact on people of different income levels. And if you’re talking about low income minorities, that virtually guarantees that there will be differences in loan approval rates under those conditions. I’m not saying that was the only reason. It was by no means the only reason. If you look at their borrowers, you discover that credit scores vary by group. That is blacks and Hispanics don’t have as high of credit scores on average as whites. And whites don’t have as high an average a credit score as Asian Americans. And in fact what is fascinating to me is how the press in pushing their case that this was a question of white racism causing blacks not to be approved as often, even though blacks like whites, most of them were approved anyway. If you look at the very same data and the very same studies you’ll find that whites weren’t approved as often as Asian Americans. So now, since most of the loan people are white, you’re going to tell me that they’re discriminating against whites in favor of Asian Americans? They’re in the business of making money. And many of the very people who are forever talking about corporate greed, don’t seem to understand the implications of that. That is, if you’re in business to make money, you’re certainly not going to turn away people who are going to pay you back with interest. Jason Hartman: One of the radio show hosts that used to be here in the LA market, he was very popular and he endorsed us on our radio advertising, our commercials. He was reading our commercials a lot. And one of the things he said when I saw him speak once, is he said, “can you imagine the conversation that would happen when people accuse companies of discrimination, some executive is sitting at the breakfast table, who runs a huge company, talking to their spouse and they’re spouse is saying, you know let’s get a bigger, better, nicer home. And the executive would be thinking well gee, I don’t want to sell to people of a certain race…” Can you imagine they would turn down money? Thomas Sowell: They never have. And more over, this is not a question of the person at the bank or lending agency. He’s probably going to see this applicant one time. Jason Hartman: Right, or maybe they never see them at all. Thomas Sowell: That’s right. In many cases you don’t even see them. Because you do it over the phone. And their contact with them in the future will just be checks arriving in the mail. And the idea that this guy is going to be sitting there thinking oh, I know this guy’s black and I hate to see his check coming in this month. Jason Hartman: Yeah. Just on the face of it, it just doesn’t make any sense. Because everybody goes for the green. Everybody likes the money. Well, besides the community reinvestment act and other similar pressures, what else went on with the housing boom and bust? In your book you break it up into the economics, the politics, and then some mystiques and housing mistakes. Tell us about that. Thomas Sowell: In addition to the pressures on the banks to lend, there was also the pressure on Fannie Mae to purchase mortgages for people of low to moderate income, as they put it. And in other ways consistent with a community reinvestment act. And so the bank can then lend really to people, whatever race they might be, of low credit rating, that they would never lend to if they themselves were going to collect this money. What the banks do in this case is they can make their mortgage, sell the mortgage to Fannie Mae, collect their money now on a 30 year loan and let Fannie Mae worry about what’s going to happen while these people will pay this thing off for 30 years. And so it was government subsidized moral hazard. And Fannie Mae of course had the tax payers to back them up. So risky mortgages carry higher interest rates, Fannie Mae has every incentive to buy these risky mortgages because if they make a profit then Fannie Mae profits, and if they make a loss again they have the tax payers to fall back on. Jason Hartman: Yeah, and then they also have the printing press to fall back on to with the Federal Reserve right? Thomas Sowell: Yes. Now the politics of it are just unbelievable because all sorts of people, not only in the United States but overseas, the economist magazine started warning some years ago that there were all these risky mortgages out there on American houses. People overseas were buying securities based on those mortgages and the whole thing looked very shaky. So they did not lack for warning. The head of the federal deposit insurance corporation warned them. Security of the treasury Snow warned them, Alan Greenspan warned them about Fannie Mae, I even did a piece in the Wall St journal just joining the mob. You could just name Barron’s, Fortune, all sorts of people warned them and the answer was always the same. That to the extent that you emphasize safety, and the danger, to the extent that you emphasize safety you’re going to reduce the ability of the banking system to make housing affordable. There was just no telling them anything until the whole thing burst. Jason Hartman: Yeah it was a big house of cards and moral hazard. And this is the problem Thomas, when government gets involved it becomes a special interest nightmare. If the government just stays out of the way, all of these special interest and all of these people that have their own agendas that are contrary to really the public good in most cases, at least on the long term public good. Sometimes in the temporary they slap a band-aide on problems but they never really seem to cure them. They create dependency, the create animosity, they create class hatred. It seems to me like when you’re talking about this issue we started off on of CRA and race and underserved population and things, it seems to me that if the government really wanted to be neutral they’d stop counting and stop asking. I’ve sort of always wondered why they even ask what race I am on the census form and on a loan application. I know on a loan application you don’t have to answer it, but why do they even count this stuff? Thomas Sowell: Because there’s political mileage in it. One of the other aspects of government, and this would be state and local government, there was a very false premise quite after the racial aspect. There was a fundamentally false premise behind this whole drive for creating more affordable housing. And that was that there was a national problem of unaffordable housing. It’s just clear beyond words and I site all the sources and so forth in the book The Housing Boom and Bust. But there was not a national problem of housing becoming unaffordable. What there was, were particular areas of the country. Coastal California being the classic example where housing was indeed enormously expensive. The average house in California sold for some multiple of the national average. I have to live in one of the areas where at one time the San Mateo County, the average cost of a house during the boom reached over a million dollars. And the average size of the house was less than 2,000 square feet. We’re not talking mansions. Jason Hartman: Yeah, no these are $500 a square foot. It got worse than that. High rises in Miami and Las Vegas at the peak were a thousand dollars a square foot. It was just crazy. It was so out of sync. And one of the things that I always say to people is that in a country as large and diverse as the United States of America, there is no such thing as a national housing market. There are about 400 distinct markets, and they really are quite different, aren’t they? Thomas Sowell: They are. And the places where housing was very expensive, for example in California but many places where the average price in taking out a new mortgage would pay ½ the family income just to put a roof over their head. Now, but those were very few places and you can see that this is where the housing prices shot through the roof, this is where the housing profits fell down through the basement after the bust. I saw a statistic recently – something like I think it’s 5 states where over 60% or about 60% of all the defaults occurred in 5 states. And if you looked at it more closely, you’d see that they occurred in particular areas within those 5 states. Even in California there’s some places further inland where housing prices are not astronomical. The government was determined that there was a national problem, and therefor they created this national program which then created a very real problem which we’re still living with. Jason Hartman: So when you say they created the national program, to what are you referring? Are you referring to Fannie Mae? Thomas Sowell: I’m referring to the affordable housing schemes and the fact that the banks were under pressure. They had to submit those statistics that you mentioned about race income and all of that kind of stuff in order to get permission to do the ordinary things that businesses do because they’re a regulated industry. Jason Hartman: Yeah. Thomas, it just seems to me like the whole concept of Fannie Mae or Freddie Mac is acting contrary to it’s supposed goal. Because if you think about it, the whole concept, it’s right in Fannie Mae’s mission statement. Their goal is to promote housing and home ownership. Well, by obvious result is that whenever you promote anything it becomes more popular and by the basic rule of economic supply and demand, it becomes more expensive doesn’t it? Thomas Sowell: It does, except in the case of housing I think the Federal Reserve has gotten a little bit more blame than it should have in the sense that they did create the expanded credit that allowed this to happen. The fact is, in places where there’s been an increased demand for housing, even when you double or triple the number of housing within say a decade or so – the housing prices do not rise if the suppliers are allowed to supply the housing. The key to the California situation is you have all these open space laws, historical preservation laws, farm land preservation laws, and they’re not allowed to expand the housing. And so therefore the most modest increase in demand for housing will shoot their prices up through the roof. Jason Hartman: Right, and that’s the old concept of that riddle. What do you call a developer? Someone who wants to build a house in the woods or at the beach. What do you call an environmentalist? Someone who already has a house in the woods or at the beach, right? Thomas Sowell: Oh, it really does send my blood pressure through the roof because the prices are just out of all proportion. There’s no reason why any family should have to pay half their income just to have a house. If you look at the places in the country where the politicians have not intervened in the market, a place like Dallas or Houston, those are the places where the housing is most affordable. In fact there have been international studies showing the same thing, that the most expensive housing markets around the world in almost every case, it was because their severe limitations on building. And when you cut back on the supply of fall and demand then you’re going to have prices shooting up. Jason Hartman: So, a couple great examples of that: First of all, I’m here in Orange County California which is completely overpriced, and it’s a very unhealthy market. We have something here called the Coastal Commission. The Coastal Commission is like the Gestapo. You cannot build anything on this coastline. If you can see it from the ocean, and you want to build it, it is very difficult. And it really bugs the heck out of me, because here I pay for this enormous cost to live in this supposedly beautiful place, which it’s beautiful in many ways, but there’s no good restaurants on the ocean. We’ve got this gorgeous ocean out here and you go down to Mexico and there’s all kinds of beautiful dining on the ocean. But here in Orange County there’s about three places where you can dine on the ocean. I want to sit there and have a beer and a dinner and overlook the sea and the sunset, and you just can’t do it. It’s ridiculous. Thomas Sowell: Twice I have gone to actual meetings with the planning commission and I just wish that I had been able to take it, because it is like Alice in Wonderland. You find people there, members of the commission saying things to the developer like, “well this landscaping could be nicer” of course it could be nicer! And after you’ve made it nicer, it can be nicer than that still. It’s just that he’s trying to build what people are willing to pay for. And it’s easy to sit on the planning commission and want all kinds of things. I must say, I got so upset I almost walked out to the back of the auditorium. I said, no I’m doing this for my research. I need to sit down and just suffer through it, and I did. But I certainly wish that this stuff had been taped. Jason Hartman: You are so right about that. The hypocrisy is amazing. You’ve got all these armchair bureaucrats that dictate things under the guise of let’s preserve the beauty of the land and so forth. And certainly, there’s something to be said for planning and prudent things here. Obviously there’s a place for that – I’m sure you would agree too. But you look at a place like Aspen, Colorado. Under the guise of preserving the environment, housing has become so expensive. All of the service people that work in the restaurants, that clean the homes of these zillionaires that already have their home there, they have to live down the valley and commute in. And they talk about the environment. How good is all that road traffic for the environment? Thomas Sowell: We have exactly the same problem here. In Palo Alto, we’re right near Stanford University, only 7% of the Palo Alto policemen live in Palo Alto. Thomas Sowell: And they’re probably chiefs and officials who bought their homes 30-40 years ago. And you’re right, and the other thing which is especially ironic with all the emphasis on race and low income and so forth, these are precisely the people who are forced out of these areas because of these restrictions on building. The black population of San Francisco today is less than half of what it was in 1970. Even though the population of the city as a whole has gone up. And that’s true of a number of counties in California. Another group that gets pushed out are low income people. San Francisco in a period of about two years, they lost about 16 thousand families earning less than 150 thousand a year moved out of San Francisco. And 17 thousand earning more than 150 thousand moved in. And so you’re making it impossible for the very people that these places say they’re interested in. Another group that gets very hard hit are people with small children, school age children. They’re constantly closing schools because if you’re young enough to have school age children, chances are you have not yet reached your peak earning years. And only people who have reached their peak earning years can afford to buy the kind of housing that you have after all these restrictions. Jason Hartman: Do you think that the powers that be here, do they know that this is happening? Do they know that their designs are either corrupt or have unintended consequences as they do? Or are they just oblivious to it? Thomas Sowell: I’d suspect their oblivious at best. Because they have no incentive to find out. The utter hypocrisy in all this is that the environmentalists that push this stuff are constantly talking as if they’re trying to save the last few patches of greenery from being paved over. In point of fact, over 90% of the land area of the United States of America is undeveloped. So all the histrionics they go through is an utter farce. San Mateo County for example, over half the land in the entire county has nothing built on it. And yet they’re constantly saying oh we need more open space, and what they really mean is they want a Cordon Sanitaire around these affluent communities so that only affluent people can move into them. It’s called preserving the character of the community. And it’s a farce on the housing market because housing turns over – areas that used to be for the rich are now working class neighborhoods. Harlem for example was once a middle class Jewish neighborhood. It became a working class black neighborhood. Many places the opposite occurred. Places that were once run down have now been gentrified. It happens with commercial properties. The original Waldorf Astoria Hotel was torn down so that the Empire State Building could be built on that site. Housing turns over. What happens is that affluent people who like the way things are now, use the law to freeze that and deprive other people of the rights that they themselves exercised earlier. Jason Hartman: You could not possibly be making more sense when you say that. That is so true. It reminds me of the bumper stickers you used to see in California, “Welcome to California. Now go home.” When the state was getting inundated with so much immigration. And I live in an area right here in Orange County where there is a state beach, Crystal Cove State Beach. And it is completely undeveloped. And there are all these people who want to save Crystal Cove State Beach and make sure that nobody can ever build there. And the fact is, nobody ever goes there. It’s just weeds and if you do go down there it’s beautiful, there’s sand and waves crashing and rock formations and stuff. And it’s very nice, but it would seem to me that all of these so called inclusive, tolerant, fair minded environmental liberal type people would want to let that land be at least somewhat, and I’m saying prudently, don’t let it run amuck, let it be prudently and smartly developed so more people could have access to it. Rather than the way it is now, because there is less supply you have multi-zillion dollar homes on either end of Crystal Cove and because they don’t let anymore supply be created, they just wall off the community. Just like you said. So it is theirs and they keep other people out under the guise of what is best for the environment. Thomas Sowell: They don’t want to face that. Some years ago my wife did a local column and wrote about how you can’t be keeping everything off limits to building and at the same time think that you’re helping the poor or for that matter, in Palo Alto even the middle class can’t live there, the prices have gone up so high. Jason Hartman: Yeah, it really is just another example of restraint of trade. It’s sort of a trust though, isn’t it? It’s an anti-trust violation. Thomas Sowell: Absolutely. But there are certain kinds of anti-trust violations that the government is not interested in dealing with. Jason Hartman: That’s true. What is your prediction of, what does the future look like, and what is a strategy for our listeners? Thomas Sowell: Oh heavens, I avoid giving personal financial advice and making predictions. But the journal of trends seems to be sort of a replay of the new deal. That is these enormous sums of money that are being spent really don’t show much promise of getting us out of a recession quickly. And I don’t believe that’s their purpose. I think, as with the new deal, and Rob Emanuel the president’s chief of staff put it very clearly: you don’t want to let the crisis go to waste. Meaning that while people are panicked in a crisis, the federal government can do things they couldn’t get away with politically otherwise. Jason Hartman: Yeah, that’s the old concept of the false flag. Even if the crisis is legitimate, which this is on various levels, but sometimes the crisis is created so they can then go in and implement all their new policies. That statement of Rob Emanuel right at the beginning of the Obama Administration was very scary to me. Thomas Sowell: It was, but the media particularly didn’t say much about it. I think the tip off was this huge spending bill that was rushed through in two days, thousand pages that no one could have read. Jason Hartman: You’re talking about the Paulson one or the Obama one? Thomas Sowell: No, the one they were doing in the Obama administration. Two days, and then it sat on the president’s desk for three days while he was off on holiday. And the question becomes why is it necessary to rush such a bill through, particularly since everyone agrees that the actual money will not even be spent by the end of next year? And the answer is you have to rush it through not in order to get out of the recession, but to get the government more power before people have time to think about it, have hearings, and any opposition to develop for. And so they accomplished their purpose. Similarly with the General Motors thing. Someone asked if General Motors is going to go bankrupt, why does the federal government need to pour tens of billions of dollars into General Motors and then they still go bankrupt? Why not let them go bankrupt without the tens of billions of dollars? And if tens of billions of dollars do not buy [0:26:26.2] for General Motors or for the economy, what that buys is the power of the federal government to tell General Motors what to do as exemplified by the president getting the head of General Motors fired. Jason Hartman: Sure, and now at the end of this the government will own 60% of the company. Thomas Sowell: Moreover, the government will also subsidize General Motors in other less visible ways such as buying these kinds of cars that they’re going to tell General Motors to build. If nobody else buys them, which is a very likely thing that they will not be publically popular. Jason Hartman: Yeah, we are really on a socialist tract aren’t we, in the good ol’ US of A? Thomas Sowell: We’re on a fascist track and the socialists want government ownership as a means of production. The fascists would allow the owners to stay owners, but the politicians would dictate to them. And that’s much better politically for them in the sense that when something goes wrong with General Motors now, Obama can say well, General Motors didn’t have good management practices. So you could give it from the sidelines, force them to do things, but when things don’t work out, then you can dump the blame on the owners. Jason Hartman: Yeah that’s a good idea. It’s still a centrally planned economy, but there’s like one step removed with fascism because then you have the corporatocracy indirectly, or well directly, but they’re just a puppet of the government, right? Jason Hartman: Very interesting. So, what is coming up? You don’t give predictions, but give me some broad thoughts that you have. We won’t hold you to it, but do you think inflation is coming? Thomas Sowell: Oh, I would bet the rent money on it. I don’t know when governments that run these levels, well our government has never run these levels of deficits except in war time. And you can’t just keep doing that without inflation. You’re conjuring up money out of thin air one way or another, and somewhere down the road somebody’s going to pay for it, and who’s going to pay for it will be posterity. And as far as the politicians are concerned, that’s fine. Because posterity doesn’t vote. Jason Hartman: Right. It seems like we’re going to have a big attack on our assets and inflation is such an efficient means of wealth redistribution because it takes, and anybody who is holding assets, their assets become devalued in real dollar value. So if they have equity in real estate, if they have stocks, bonds, mutual funds. And on the other side of it, all of those who owe money, the debtors, they benefit because their debt becomes cheaper to repay, doesn’t it? Thomas Sowell: It does, but I think the real redistribution is from the private sector to the government. President Obama has said that there’s not going to be any tax increase except for those for the rich, however that’s defined. But inflation is the broadest base tax of all. The poorest person in America will find the value of his paycheck or his welfare check reduced as a result of inflation. Jason Hartman: Yeah, no question about it. And if the government maligns the numbers by which they report inflation, they can say that the CPI only increased it 4% when maybe it was really 12-15% (I’m talking about the future now). They’re essentially making the spread on that, aren’t they? Thomas Sowell: Well, that’s going to be very hard to convince people that there’s been no inflation when they’re paying more for everything they buy. Because a lot of the taxation will come through raising costs, really for private businesses and those costs will be passed on to the people who buy their products. Jason Hartman: Sure. Any thoughts on China vis a vis the US in terms of China buying our debt or objecting to buying our debt, and their fears about us destroying the value of our currency. Thomas Sowell: Well China has already expressed those fears. And they hold a very large amount of debt. The old Keynesian notion that we owe it to ourselves has long since gone by the boards. Because more than 40% of the privately held national debt is held overseas. So that means that our children and grandchildren will end up having to produce billions of dollars’ worth of products that will be sent overseas free of charge as the repayment for this debt that this generation is running up. It’s one of the most irresponsible things imaginable. You run up huge deficits during say, something like World War II because you don’t want to bequeath the posterity of Nazi government, but the posterity is gaining nothing out of this stuff. Who’s gaining is the existing administration which gains tremendous amounts of power and tremendous amounts of good publicity by handing out goodies to all sorts of groups, many of whom have nothing to do with the general health of the economy. And then this will be left to be paid for by other people who have no vote right now. Jason Hartman: Yeah, that’s so unfair, isn’t it? Well you look at the state of California and I’m so grateful that the smart people finally voted a couple of weeks ago and they didn’t go for any of these stupid tax increases, but this state is so broke. Decades and decades of irresponsible dependency creating spending. Are we looking at a federal bail-out pretty soon? Is Obama going to be running California too? Thomas Sowell: More than likely. I can remember, it wasn’t that many years ago that California had a multi-billion dollar surplus. But as you say, they had to hand out goodies to people particularly in the form of low electricity rates. So they then ran the electricity industry into the ground – we had blackouts and so forth, and they ended up having to dump billions of dollars to rescue that situation. Many people seem to think that if they don’t pay for it in cash right now, they’re not paying for it. But of course, you’re paying for it in higher taxes. So whether you pay in one form or another really doesn’t matter except politically. Jason Hartman: Right, or you might be paying not just in higher taxes, but in devaluation of your currency. Thomas Sowell: Well in cases of state, the state can’t issue its own currency. I shudder to think what would happen in California if the state were allowed to issue its own currency. Jason Hartman: Can you imagine in each state had a Federal Reserve of its own? Thomas Sowell: Oh my gosh, it would make inflation in the Weimar Republic look like child’s play. Jason Hartman: I saw an article that was interesting. I think it was just last week it ran in Bloomberg, that inflation in the US may approach Zimbabwe levels. Thomas Sowell: Oh my gosh. Jason Hartman: I don’t even think it’s going to get that bad, but I can see a lot on the horizon. But any thoughts on what the rate of inflation might be? What it might start to hit? I think we’re about two years out. Thomas Sowell: Oh heavens, I’d be surprised if sometime in the next decade it doesn’t get into double digits. Jason Hartman: At least past what we saw in the 70s probably I think. And I think that’s going to increase pressure on mortgage rates – we’re going to see much higher mortgage rates in the future, aren’t we? Thomas Sowell: There’s that, but also with inflation I don’t think the Federal Reserve with what little independence it still has, is going to let the inflation go on forever and you end up having to do what Volcker did when he was head of the Federal Reserve in the 80s, have this very sharp cutting back on the money supply, which in turn forced all kinds of people into bankruptcy. It just occurred to me, probably the average American has no memory of what happened in the 80s in fighting inflation. Because half of them probably weren’t born. Jason Hartman: Volcker now, historically, looks kind of good in my opinion. He’s the guy who broke the back of inflation and he made the country take the tough medicine, but I’m sure if you were one of those that had to file bankruptcy because of these policies, you weren’t very happy. Thomas Sowell: Well he was one of the most hated men in America. And even thought Ronald Reagan had been elected and was a very popular president at first, when he supported was Volcker was doing, Reagan’s popularity dropped like a rock. But I greatly respect Volcker. I think Federal Reserve chairmen should not try to be popular. I think it was McChesney Martin that said, “my job is to go to the party and just when people are starting to enjoy the punch or the spiked drinks, take the punch bowl away”. Jason Hartman: That’s exactly what a Federal Reserve is supposed to do, you’re right. So it’s odd to me that Volcker is advising Obama. Thomas Sowell: That’s odd to me too. Jason Hartman: They would seem completely contrary in my opinion. Obama needs loose money to pay for all of his social programs and bail-outs and Volcker is sort of a tight money guy. Thomas Sowell: Well someone has pointed out that the policies followed by this government are the opposite of the policies advocated by Summers when he was outside of government. So I’m not sure to what extent…these people are really people whose advice the president is seeking, or whether they’re simply window dressing to make this administration more palatable. Thomas Sowell: So sort of like [00:35:04] in the early days of the Hitler regime. The view was that [0:35:06.8] is a very sound man, and therefore we can rest assure that they’re not going to do any crazy things. Well, they did crazy things. Jason Hartman: Yeah, well I say to listeners: watch what they do, not what they say. And watch what they do not with whom they affiliate. Thomas Sowell: Yes, especially with this administration because Obama is really a very smooth talker. And he knows what people want to hear, and he says it, and even if it is totally contrary. He introduced Sonia Sotomayor by talking about peace with the rule of law. Jason Hartman: No, she’s an activist judge. She rules from the bench. Thomas Sowell: Absolutely. It’s really got to take a certain amount of talent and a certain kind of person to say things like that. You have to be able to look up at the sky and say it’s orange instead of blue. And say it with conviction. Jason Hartman: I guess that’s the definition of a con artist, isn’t it? Thomas Sowell: It is, it is. Jason Hartman: Well, thank you so much for joining us today. The book is called The Housing Boom and Bust by Thomas Sowell. Anything you’d like to say in conclusion for our listeners? Thomas Sowell: No, I think that’s… it’s hard to summarize a book that’s very compact as it is. But I think you’ll find out that, as I say at the beginning, there is plenty of blame to go around, so all the finger pointing, especially the finger pointing outside of Washington is just a charade. Jason Hartman: It sure is. The special interest have taken over, that’s for sure. Thank you so much for joining us today. We really appreciate your words of wisdom and your insights. Thomas Sowell: Thank you, goodbye. Narrator: The American Monetary Association is a nonprofit venture funded by the Jason Hartman Foundation which is dedicated to educating people about the practical effects of monetary policy and government actions on inflation, deflation and personal freedom. Our goal is to help people prosper in the midst of uncertain economic times. This show is produced by The Jason Hartman Foundation, all rights reserved. For publication rights and media interviews, please visit www.HartmanMedia.com or email [email protected] Nothing on this show should be considered specific personal or professional advice. Please consult an appropriate professional if you require individualized advice. Opinions of guests are their own and the host is acting on behalf of The Jason Hartman Foundation exclusively.